Conte's Pasta has had their gluten free pasta products available for about a year. 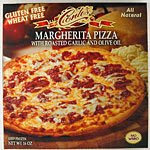 More recently, the company introduced two pizzas to its product line - Margherita and Mushroom Florentine. We've tried the garlic-accented Margherita version and it is tasty. Conte's products are available at the company store, located on East Wheat Road (!) in Vineland, New Jersey. The pastas and pizzas are available locally at select health food stores and supermarkets and online at retailers such as Glutenfreemall.com and Amazon.com. Through March 31, 2009, Amazon is offering an extra 20 percent off instantly when you spend $59 or more on eligible Conte's products offered by Amazon.com. Enter code CONTEI24 at checkout.